Purse Search Ireland: A Shark and Ray Eggcase Sightings Scheme for Ireland. 2009. Purse Search Ireland is a project designed to raise public understanding and enjoyment of marine science, whilst also increasing our knowledge on the distribution and occurrence of shark, skate and ray nursery areas around the coasts of Ireland. The main aim of the project has been to encourage people to report their observations of mermaids’ purses, which are actually the eggcases of sharks, skates and rays. Eggcases can often be seen washed up on the seashore, sometimes indicating that there may be a nursery area close by. This report summarizes the initial findings from the pilot project, which ran from 2007 to 2009. Funding during this time was gratefully received from Bord Iascaigh Mhara, the National Parks and Wildlife Service, The Heritage Council and Forfas Discover Science and Engineering. To Investigate Critical Habitats for Threatened Species of Skate and Ray. 2010. This project was prompted by results obtained from the Purse Search Ireland pilot project. Interviews with volunteer observers and local fishing communities following up on citizens’ sightings confirmed that Tralee Bay has been serving as a nursery area for the critically endangered White Skate Rostroraja alba and endangered Undulate Ray, Raja undulata. It was also found that Clew Bay serves as a nursery area for critically endangered Common Skate Dipturus batis. Continuation of the Purse Search project in 2010 also highlighted a likely nursery area for White Skate in Galway Bay. Funding for this project was gratefully received from the Heritage Council through Heritage Research Project R00261. 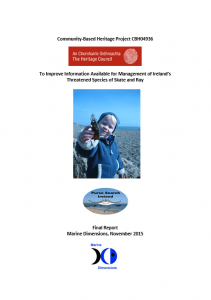 An Inventory of Elasmobranch Databases for Irish Waters. 2011. In 2011, a project was set up by Ireland’s National Biodiversity Data Centre and National Parks and Wildlife Service with the aim of integrating Ireland’s principal elasmobranch (shark and ray) datasets into one common All Ireland Elasmobranch Database. Our director, Dr Sarah Varian, was contracted to prepare this review, assessing potential elasmobranch data sources and establishing an inventory. The process of compilation and digitisation was then completed by the Data Centre, with a view to making data available through the Centre’s mapping system, Biodiversity Maps. It was also hoped that the combined All Ireland Database would lead to a Red List Assessment of Ireland’s Elasmobranch species, which later took place and was published in 2017. Funding for this project was gratefully received from the National Biodiversity Data Centre and National Parks and Wildlife Service, Department of Heritage, Environment and Local Government. To Improve Information Available for Management of Ireland’s Threatened Species of Skate and Ray. 2015. This project aimed to disseminate and publish archived data gathered through the citizen science project, Purse Search Ireland. Analysis of data reported by volunteer observers through 2010-2015 highlighted several new sites likely to serve as nurseries for threatened species, including the endangered Undulate Ray Raja undulata and critically endangered White Skate Rostroraja alba and Common Skate Dipturus batis. Funding for this project was gratefully received from the Heritage Council through Community-Based Heritage Project CBH04936. To Identify Spawning, Nurseries and Essential Habitat of Endangered Skates off the West Coast of Ireland. 2017. 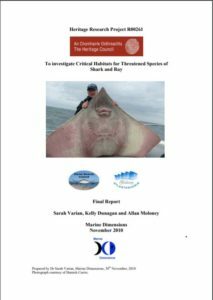 Marine Dimensions was contracted by the Marine Institute as a consultant on this EMFF project, with the aim of reporting on the essential habitat and nursery sites for several species of endangered skate, ray and flat shark off the west coast of Ireland. 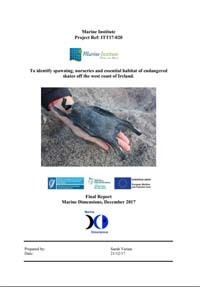 Consequently, review of available scientific information highlighted the importance of citizen science programmes and local community based observations for these species, with nursery areas for the endangered Undulate Ray, Raja undulata, critically endangered White Skate, Rostroraja alba, and Flapper Skate, Dipturus intermedia, identified around Ireland’s coast. A simple index, the Nursery Hotspot Indicator (NHI) Index, was also developed for use as a tool for prioritising sites for ongoing monitoring and conservation management. Funding for this project was gratefully received from the Marine Institute through the EU European Maritime and Fisheries Fund Programme. Third Edition of the North Western Waters Atlas. 2015. 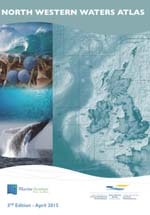 The third edition of the North Western Waters (NWW) Atlas is a joint publication between the Marine Institute and the NWW Advisory Council. The Atlas aims to provide a broad overview of the ecosystem of the NWW region, including information on the habitat types, biodiversity, fishing activity and other human activities. The North Western Waters (NWW) area is situated in the north east Atlantic off the west coast of Ireland and Scotland, and extends into the Celtic Sea, Irish Sea and the English Channel. Marine Dimensions provided data resulting from the Purse Search citizen science project for the Atlas, including distribution of elasmobranch eggcases sighted around Ireland’s coastline. Ireland Red List No. 11: Cartilaginous Fish [Sharks, Skates, Rays and Chimaeras]. 2016. 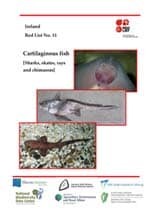 The Red List for Ireland’s Cartilaginous fishes was published by the National Parks and Wildlife Service in 2016, with a view to assessing the conservation status of Ireland’s sharks, skates, rays and chimaeras. Marine Dimensions provided input into the first Red List Working Group meeting that informed the report, including advice provided through the Inventory of Elasmobranch Databases for Irish Waters project (listed above). Ireland’s Sharks and Rays Poster. 2008. 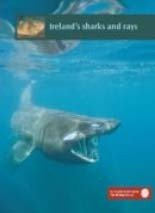 In 2008, Marine Dimensions was commissioned to produce a poster on Ireland’s sharks and rays for the Heritage Council’s marine and coastal publication series. The poster aims to raise awareness for Ireland’s sharks, skates and rays, some of which are threatened with extinction. A wide variety of sharks and rays inhabit Irish waters, including 39 species of sharks and 28 species of skates and rays. Members of this diverse group can be found in all our seas, ranging from shallow estuaries down to depths of 2000m or more in the Atlantic.